Some sports leagues and teams are trying their best to solve this problem. Most recently, on October 9th a brand new “W Series” (W standing for women) was announced so that elite female talent can be discovered for Formula One (F1) and other high-level pro racing series’. F1 is the highest class of single-seater auto track racing. Only the best of the best racers get to compete in it. The W Series is set to launch in May 2019 as a “unique, groundbreaking, free-to-enter single-seater motor racing series for female drivers only, with a top prize of $500,000 USD for the winner and a total prize fund of $1.5 million USD.” The series is supported by former F1 race winner David Coulthard and legendary F1 designer and engineer Adrian Newey. Sounds amazing right? That was our first reaction. How cool would it be to see an all-female race?! BUT, as the news settled and we started to read the comments from some of the biggest female names in racing, we realized that this series might come with some downsides as well. The main issue? It sends the message that it’s okay to segregate women from men in the sport. So, in this Deep Dive we’re gonna go through the issues. The pros, the cons, and everything in between. TBH, we’re not 100% sure of what we think about the W Series but wanted to provide you enough info so that you can make your own informed opinion. So here’s the thing. Unlike many traditional sports that have a need to separate women from men because of biological differences, both men and women have the same ability to drive a car. There’s no need for separate leagues. What is interesting with racing, is that the driver’s skill comes from his or her ability to react quickly, act strategically and work against the forces within a contained cockpit. Ones success is not dependent on the driver’s, or their opponents, physical size or force. Yes, you have to be incredibly fit; however, drivers actually tend to be quite small as any extra weight means more weight for the engine to carry, which means the slower your car goes. Despite this, since F1’s first championship season in 1950, only two women have participated in F1’s Grand Prix race. And the last woman to race, Lella Lombardi, competed over 40 years ago! Why Aren’t More Women Racing? Well, more than other sports, there are a lot of barriers to entry with motorsport in general and with F1. Most notably, to participate in this sport you need an f*** tonne of money. One car can cost anywhere between $10-20M USD and apparently, teams spend anywhere from $120 to upwards of $250M USD per year. PER YEAR!!! Just crazy. And, as mentioned before, women receive less than 1% of sports endorsement money. As a result, it’s a lot harder for a woman to have the resources to put together a great car and great team in order to participate at the highest level. Next, women’s capability in racing seems to have always been questioned. Driving cars has traditionally been something that men do. 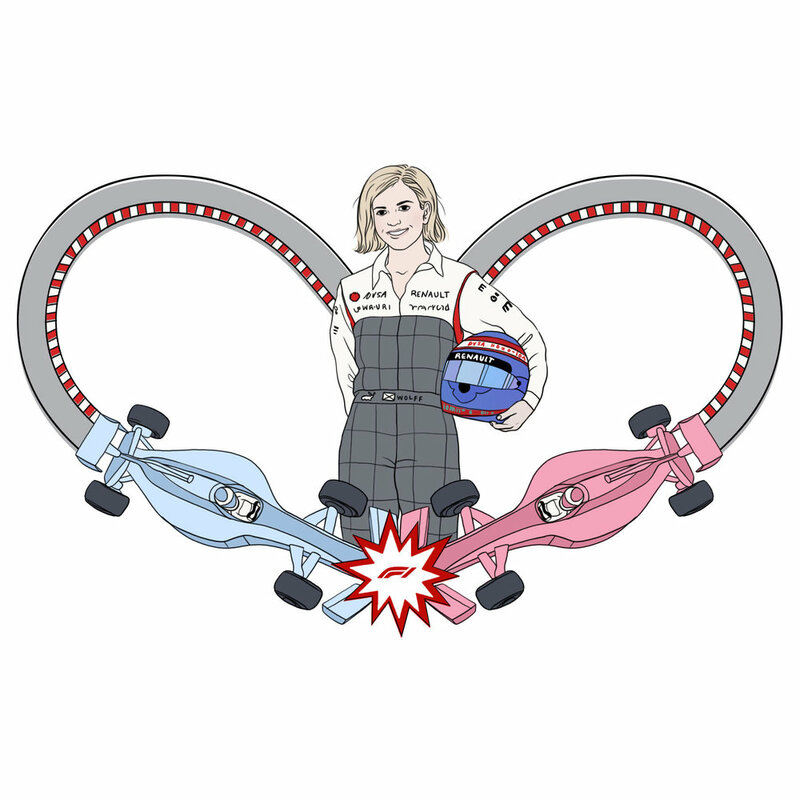 For example, Susie Wolff was one of the only female racers that young women fans could look up to as a role model. Uh… dude, are you f***ing kidding?! Wolff recently retired from the sport and decided to prove men like Moss wrong. She became the Team Principal of a Formula E team and set up a non-profit organization called “Dare to be Different”. Dare to be Different helps females get behind the wheel AND to get involved in the science and technology of the sport. Pretty amazing stuff if you ask us. Ultimately, there’s no reason why women shouldn’t or couldn’t compete at the same level as men. So it’s no wonder people have thought of things like the W Series to improve equality in the sport. The W Series is a free-to-enter series, with a $1.5M prize purse, that is supposed to act as a stepping stone for women to get to F1 racing. Sponsorship is not required to enter; however, women will have to prove their ability in an intensive selection process to ensure the grid is full of the best talent possible. Let’s dive into the W Series a little bit more. There are a lot of different opinions on the W Series, but let’s hear from the series’ supporters first. "Having raced for more than a decade in karting, Formula 3, GP3 and World Series among others, but having been a very small minority in getting that far in motorsport, I know how difficult it is for female drivers to get opportunities to progress their careers," she said. “Hopefully this series helps provide those opportunities to some young rising female talent and eventually allow the best to prove that we can compete at the same level as men." Jamie Chadwick, who competes in British F3 and became the first woman to win a race in the series this summer, is also down for World Series. It’s interesting that even Chadwick, who is all for the series, still thinks of it as a “supplemental option” to the standard F1 series route. Still, there are other females driver that don’t think it’s an option at all. Pippa Mann, who has raced in IndyCar’s most famous race, the Indy 500, seven times wasn’t shy about her feelings towards the series. "What a sad day for motorsport," she said on Twitter. "Those with funding to help female racers are choosing to segregate them as opposed to supporting them. I am deeply disappointed to see such a historic step backward take place in my lifetime." European F3 driver Sophia Floersch had similar feelings. "I agree with the arguments [made by W Series] -- but I totally disagree with the solution. Women need long-term support and trustful partners. I want to compete with the best of our sport. Please compare it with economics: Do we need separate Women Management/Advisory Boards? No. Wrong way." Charlie Martin had some of the strongest words about the series. Martin, who is trying to become the first transgender driver to race in the Le Mans 24 hours (a race that lasts for 24 hours straight and ruins us fans’ sleep schedules for weeks), told CNN: "While it may create opportunities for some female drivers, it sends a clear message that segregation is acceptable. We no longer discriminate in sport based on race, so it is particularly jarring that we feel it is acceptable to do so based on gender in 2018. As racers, we want to compete against the best drivers -- regardless of age, race, sexual orientation or gender -- and prove we are the best at what we do." So what’s the best solution?! Honestly, we don’t really know. We don’t think the W Series is some evil plan concocted by men to kick women out of the sport. In fact, we hope this series has a knock-out inaugural year in 2019 where we get to see some elite racing and female drivers on the track who would normally not get the opportunity. However, as Floersch said, women need a long-term solution and long-term support. And we’re not convinced the W Series is it. These women want to race at the highest level against the best drivers. But what we’re scared of is that instead of using the W Series as a springboard into F1, that it could pigeon-hole women into only competing in the W-Series. What will really be the deciding factor as to whether the W Series is actually successful, is if we see women competing in F1 in 2020, 2021 etc. And, if we see a lasting increase in female drivers across different pro racing series’, including F1, for years to come. Let us know what you think! Do we think the W Series is the solution? Is it just adding to the problem? Or do we just need to give it a real chance? Let us know in the comments.